The Cyanogen team does it again. I took the leap and installed this on my TouchPad and wow!!! This is wicked. I went to Best Buy today to compare the performance on the TouchPad to that of other available devices. I left the store with a smile, the TouchPad even with the remaining bugs in this build, can compete with the most expensive Android 4.0 device. I cant wait till the Cyanogen team perfects this mod. Today they published an update (actually a bundling of updates). Android 4.0 Ice Cream Sandwich on the HP TouchPad. That $100 investment keeps paying off. This is the 3rd OS for the hardware that HP just couldn’t sell with Web OS. Was the Courier Project really killed off or did it transform into the Surface, OneNote and Windows 8? 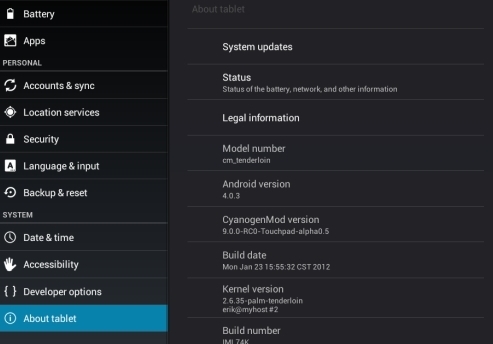 CM9 Developers to all HP TouchPad owners – Surprise!